When students become a part of the Eagle family at Polk State College, they also have the opportunity to become Knights or Bulls in training. Through the College’s partnerships with University of Central Florida’s Transfer Connect and University of South Florida’s FUSE, students have the ability to seamlessly transition from Polk State’s Associate in Arts program to bachelor’s degree programs at the partner colleges. One of the many benefits Polk State students receive through these programs is services provided by academic advisors from UCF and USF, in addition to those provided by Polk State advisors. While all students with Associate in Arts degrees from Polk State are promised admittance to a state university under Florida’s 2+2 articulation agreement, Transfer Connect and FUSE create pathways for students that increase their chances of being accepted into specific programs at USF and UCF. The academic advisors from these universities work collaboratively with those at Polk State to assist students in completing those pathways. They meet with students each semester to monitor their academic progress and to ensure that they are enrolling in the necessary courses to not only complete their Associate in Arts degrees, but to also meet prerequisite requirements for their prospective bachelor’s programs. Polk State News recently caught up with Jessica Matos, UCF Connect Success Coach. Below, Matos shares the benefits of Transfer Connect and her passion for helping students through their higher-education journeys. Students have the opportunity to learn more about UCF Transfer Connect at info sessions on February 22 and April 4 from 10 a.m. to 1 p.m. in WLR 308. There will also be an info session on the Lakeland Campus on April 17 from 10 a.m. to 1 p.m. in LTB 1290. What type of support do you provide students as a Success Coach? All types of support as it relates to the University or Education paths of each student. This includes but is not limited to contacting each student who fills out a Transfer Connect inquiry form, talking with them about their educational goals, and ensuring they get started on the right path to meet those goals by choosing the right degree program, navigating the admissions process, and providing overall support and guidance in conjunction with their academic advisor to help them be a successful student at UCF. Once they start their courses, I will continue to collaborate with them on creating strategies to stay on track in their program, which will sometimes entail getting them connected to other resources for program specific support. My bachelor’s degree is in Elementary Education. My master’s degree is in Career and Technical Education. I chose these degrees because I have always been interested in the subject of Education in general. In my career as an advisor and success coach for UCF, I have had the privilege to assist students with many various aspects of their educational paths, from the day they are first admitted to the day they graduate. I enjoy helping and serving these students achieve their educational goals because I want others to succeed just as I have. When I see students working toward and achieving their educational goals, it gives me a sense of accomplishment if I’ve played even a small part; whether it be helping them choose a major or helping them with their degree audit. I enjoy feeling like at the end of the day, I made their journey towards their educational goals a little bit easier. What specific services do you offer to UCF Transfer Connect students? There are a full range of services offered to UCF Transfer Connect students. As the UCF liaison to Polk State College, I am available to help and assist with the enrollment and admissions process. I am able to make admission decisions once I’ve verified a transfer student’s eligibility and I offer Financial Aid advice to those that need it. I also offer information on the Veteran Affairs Educational benefits for veteran students and their eligible dependents. There are many undergraduate majors at UCF, and one of the services I offer regarding this is to discuss these majors with students so that if they may be having trouble selecting the one they desire, I may be able to help them reach a decision based on their educational goals. How do you work collaboratively with Polk State advisors to serve the College’s students? 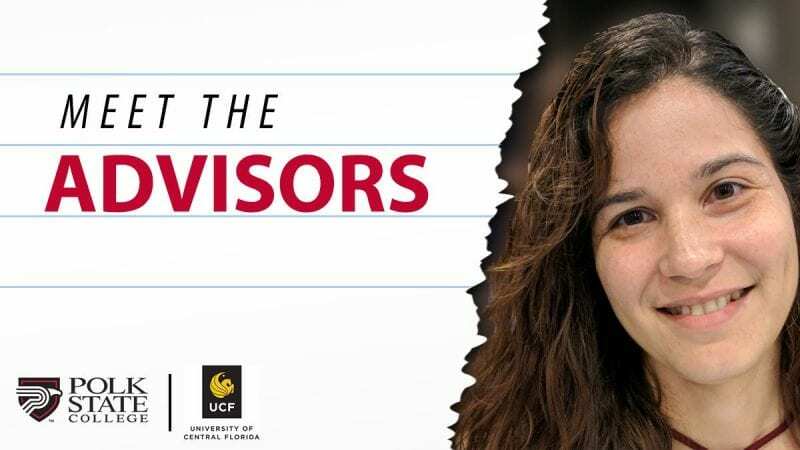 For the past ten years, UCF Connect has worked closely with the advising offices of six state colleges on a well-established regional undergraduate partnership program. It is this expertise in relationship building and development that we bring to our Transfer Connect partnership. I am available via email, phone, or Skype to Polk State advisors. I plan to visit at least twice a semester to not only meet with students, but to also meet with Polk State advisors to update them on UCF. Outside of my job, I enjoy a simple life. I enjoy going to church. I also enjoy staying at home and firmly believe the saying: “Instead of wondering when your next vacation will be, maybe you should set up a life you don’t need escaping from.” Once per year, I like to vacation for my wedding anniversary. I enjoy these vacations very much because I get to see parts of the world which I haven’t had the opportunity to visit or that I always wanted to visit, but never got the chance to. For example, so far, I’ve been to London; multiple cities in The Dominican Republic; Honolulu; as well as Venice, Florence, and Rome. Why would you encourage students to join the UCF Transfer Connect Program? I encourage all types of students to join the UCF Transfer Connect Program, whether it’s students who have no other responsibilities than completing their bachelor’s degree, or students who are juggling school with work and other life responsibilities. It will ensure a smooth and easy transition from Polk State to UCF. As a mother who had to work 40 hours per week and go to school while juggling motherhood and family life, I understand the challenges students may face while trying to earn a degree. UCF has a myriad of available class times to fit into the schedules of nearly every type of student, as well as online classes, which may accommodate those busy trying to balance work with school. I do not think I would have been able to achieve my educational goals without the flexibility of UCF. So, I say this to any student worried about not being able to juggle all the aspects of their lives with their educational goals: If I could do it, you can too. When someone has the dedication to see their education through, and there’s a will and desire to accomplish their degree, there is a way. Doors will open and success will be had, and if ever you need a little guidance or advice along the way, advisors are there for you when you need them.